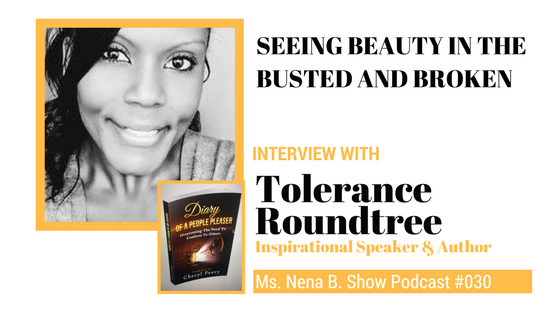 030 – Interview with Tolerance Roundtree – Seeing Beauty in the Busted and Broken – Ms. Nena B. Sometimes life leaves us busted and broken and feeling like we are left for trash. How amazing that someone’s passion is about salvaging the lost. 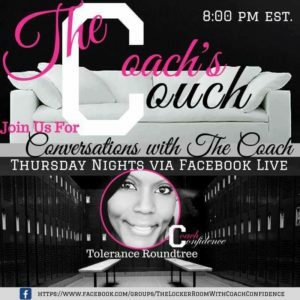 Tolerance Roundtree a.k.a “Coach Confidence” knows what it’s like to have life try to break her spirit. She reaches as far as possible into the “pit” to pull out as many women as possible. In hopes that they will not only see but be confident in who God created them to be. She is a Motivational Speaker as well as Published Author. Her motto: I can’t make you believe in you. But I will spend my life showing you just how amazing you are! At the age of 5 her mother’s boyfriend tried to take her mother’s life. She was molested by two cousins from the age of 6 until she was 8. She was an alcoholic by the age of 17. She has endured two failed marriages and what would seem to be a lifetime of setback. However, her confidence in God and her strong belief that this would not be the end of her story has encouraged her to fight for her purpose as well as her dreams. She has made it her life’s goal to reach out and motivate as many women as possible. She wants each and every one of them to know there is life after a setback, there is life after abuse, there is life after what seems to be “death” and most importantly there is a God who cares. Follow Coach Confidence on Facebook and Instagram.